Our full-size Baby and Hair range in one gorgeous gift bag! Everything your little one could need for a full-on pampering session is here: Soft & Splashy Bubbles, 250ml, create oodles of bubbles without drying Baby's delicate skin, Very Gentle Top to Toe Wash, 250ml, gently washes body while softening olive oil and oats moisturise skin. Meanwhile, our gentle, natural Shampoo and Conditioner, 250ml, will leave locks soft and tangle-free. Soothe your tots' skin with Kind & Creamy Baby Lotion, 100ml, enriched with Tahitian monoi and pomegranate extract to nourish and soften, or have some wind-down time with Kind & Calming Massage Oil, 100ml, with organic lavender and rosehip oils. Finish off with our amazing nappy-rash fighting Soothing Bottom Butter, 50ml, to banish sore botties in an instant! 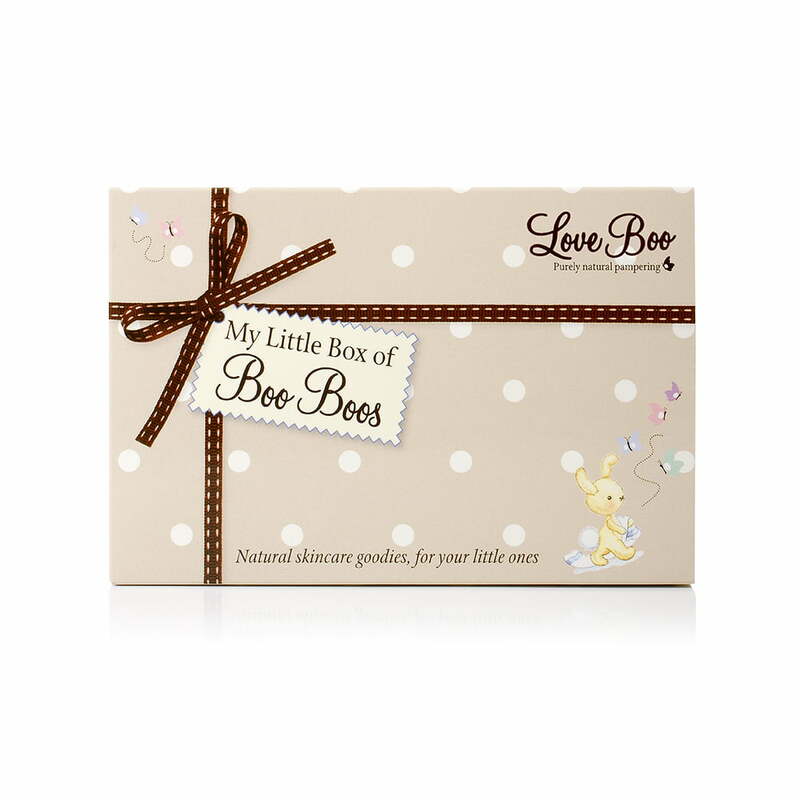 Love Boo Baby are winners of the prestigious Mother & Baby Gold award! All our goodies are paraben and SLS free - as gentle as can be! The perfect pampering gift for Baby or new parents! I love this natural baby range!! The tiniest amount of Top to Toe Wash creates masses of creamy bubbles to gently cleanse Baby's body. Our Soft & Shiny Shampoo and Conditioner contain fig and argan oil to leave hair extra shiny and easy to comb. Top-to-Toe Wash: Aqua, sodium cocoamphoacetate, sodium lauroyl sarcosinate, cocamidopropyl betaine, lauryl glucoside, decyl glucoside, dlycerin, coco-glucoside, glyceryl oleate, pyrus malus (apple) extract, gardenia tahitensis (tahitian monoi) flower extract, avena sativa (oat) kernel extract, olea europaea leaf extract, parfum, sodium hydroxymethyl glycinate, citric acid. Baby Massage Oil: Caprylic/capric triglyceride, rosa damascene (rose) hip oil, simmondsia chinensis (jojoba) seed oil, lavandula angustifolia (lavender) oil, linalool, geraniol, limonene. Soft & Shiny Shampoo: Aqua, Cetearyl alcohol, Brassicamidopropyl dimethylamine, Polyquaternium-22, Caprylic/capric triglyceride, Trimethylsilylamodimethicone, Parfum, Argania spinosa (argan) oil, Cocos nucifera fruit extract, Carica papaya fruit extract, Mangifera indica fruit extract, Theobroma cacao seed extract, Garcinia mangostana fruit extract, Ficus carica fruit extract, Ceteareth-20, Aspartic acid, Disodium EDTA, Chlorphenesin, Magnesium chloride, Methylchloroisothiazolinone, Magnesium nitrate, Methylisothiazolinone, Ascorbic acid, Citric acid, Potassium sorbate. Soft & Shiny Conditioner: Aqua, Cetearyl alcohol, Brassicamidopropyl dimethylamine, Polyquaternium-22, Caprylic/capric triglyceride, Trimethylsilylamodimethicone, Parfum, Argania spinosa (argan) oil, Cocos nucifera fruit extract, Carica papaya fruit extract, Mangifera indica fruit extract, Theobroma cacao seed extract, Garcinia mangostana fruit extract, Ficus carica fruit extract, Ceteareth-20, Aspartic acid, Disodium EDTA, Chlorphenesin, Magnesium chloride, Methylchloroisothiazolinone, Magnesium nitrate, Methylisothiazolinone, Ascorbic acid, Citric acid, Potassium sorbate.